Months ago I posted a picture of this homemade laundry detergent on Facebook. Some of my fans asked for the recipe to make it, but I didn’t really feel like that topic “fit” over on RoseBakes.com, so I saved the idea until I could get RoseAtwater.com up and running… so here it is! Let me first tell you that I found this recipe over on How Does She? and if you want lots of pics and details, please visit that post! Before I share the recipe, let me tell you my experience with it. I made my first batch on June 3, 2013. Today is September 5, 2013 and I still have more than half of it left. I keep the bulk of the detergent in a plastic trash can with a lid and refill the small bottle around the 1st of each month. It lasts an entire month. To give you a little more perspective, we have 6 kids. We do 2-3 loads of laundry on a typical day and we usually do that 5-6 days a week. That’s a lot of laundry. A lot. Update: This recipe lasted my family from 6/3/2013 to 11/20/2013. That’s about 5 1/2 months of laundry detergent for a family of 8 (I average 14-16 loads of laundry per week). This detergent smells good, lasts a long time and is dramatically cheaper than store-bought detergent. I wish I had an actual cost break-down (and I will update with the cost the next time I buy all of the ingredients), but I’m 100% certain that it’s saved us a TON of money! Also, when restocking to make more, I saved my receipt and the “ingredients” cost me $27.38 at Walmart (I was able to get everything there this time). Under $30 for 5 1/2 months of detergent., … so just under $5 a month or around $.16 per day. I guarantee I’d spend a lot more than that buying even the cheapest detergent from the store and this detergent smells great, works great and we just love it! * The first time I made it I grated that pink Zote soap. Next time I’ll microwave and crumble it because the grated soap sort of clogs up the spout on the bottle and makes it a pain to pour. *I live way out in the country and my shopping options are incredibly limited. However, I was able to find everything listed below at Walmart (about 40 miles from my home) except the washing soda – I had to order it online! 1. Microwave and crumble the Zote soap (or grate it, but personally, I’ll microwave next time! See how to do it here!) After trying grating, microwaving and pulverizing with a food processor – I highly recommend the food processor!! It worked SO much better than either of the other methods! I just cubed the Zote into 1 inch squares, dropped it in with maybe half of a cup of one of the other powdered ingredients, then processed it until it was small “pebbles”. Love it!! 2. Stir all of the ingredients together in a large container – I bought a 10 gallon trash can with a lid and store mine in that! And that’s it! 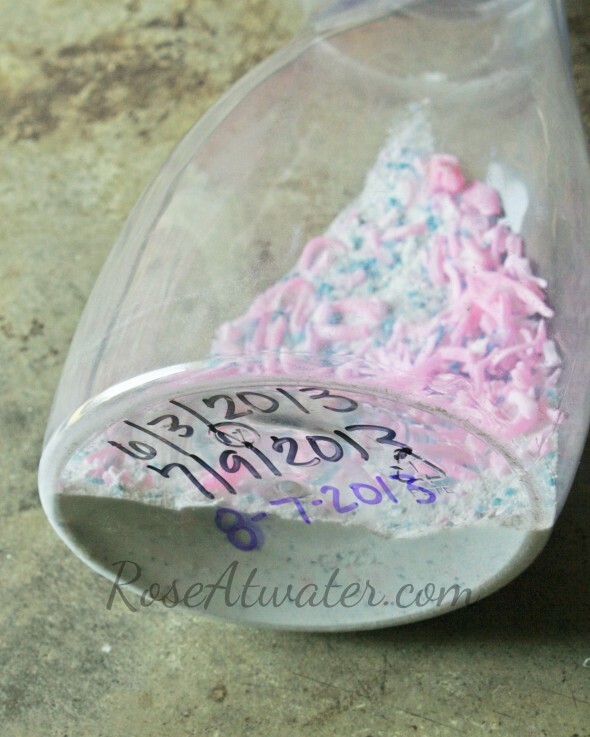 You’ll have months and months worth of wonderful smelling and cheap laundry detergent! 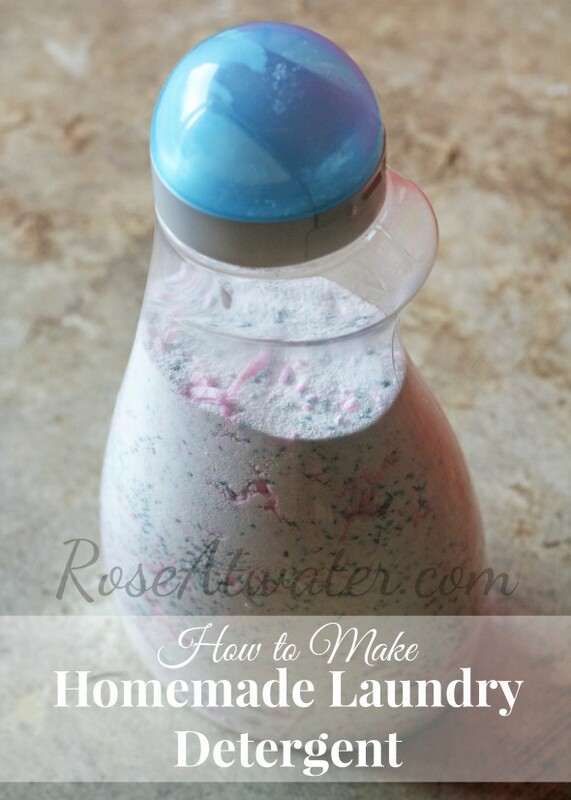 I love to hear from readers, so please leave me a comment telling me about your experiences or plans for homemade laundry detergent! « Pizza Hut Book-It Program: Enroll Your Homeschoolers! I printed out the “homemade detergent” gift tags, but the recipe on the card says to use “two” purex crystals in the 55 oz size…..but your recipe online just says to use “one” bottle of the 55 oz?? Do I use one or two? Thanks! I’m not sure which gift tags you’re referring to (I don’t have any of those on my site?? ), but I only use 1 bottle of the Purex Crystals. Thanks for the update. Considering doing this. Sounds great! Can this be used in the newer “he” washers? Yes this is HE safe! I use Fels naptha instead of Zote but both are low sudsing and that is why it is HE safe! Is it suppose to be sudsy? I’m so use to sudsy. No, it’s not sudsy, but it still works great! Had to use Fels Naptha as i couldnt find the Zote Soap in my area….i tried to do the crumble technique and it was really hard, seems like i had to zap it for a lot more than 1 minute and then just burnt my fingers but i love love love that my house smells really fresh now!! I used the napa soap and cooked it in the microwave for 1 minute, and because I burnt my fingers 🙂 I used a fork and knife to break it apart and into small pieces for the chopper. If you buy fels naptha and open the paper at the end to let it dry for a couple of weeks, it grates really well with a fine grater. I haven’t tried the zote. I’ve used a similar recipe in the past (just Fels Naptha, washing soda, and borax) and it faded our clothes terribly. Have you noticed that effect with this recipe? No, I haven’t noticed that! I was able to find ZOTE FLAKES at Wal-Mart, 1 box = 2 bars. Just finished combining mine, can’t wait to try it! I would LOVE to find some of that!! I use cold water 99% of the time, but I’ve also used it with hot water when doing sheets and it works just as well. Do you think putting the soap in a blender would work? I’m not sure! You could probably click over to the original post and check comments there… I bet it has come up before! I was wondering if it’s supposed to be soapy? I made mine but seems like it’s not soapy at all. No, mine is not super soapy but it works great! Thank you for the response, thought I did something wrong but I do love the smell and seems like the clothes are clean 🙂 thanks again for sharing! I just put my first load on with the homemade detergent!! I found that if you cut up, microwave, then use a food processor on the soap(Fels Naptha) it was much easier. I tried without mircowaving and it just clumped up! The microwave trick might work better on the pink Zotes??? They didnt have that kind at my Wal-mart…. Will update when the clothes are done!!! Great tip! My store only had the Zotes, so that’s my only experience so far! Yes food processor was the way to go!! I love the detergent!! About to make my second batch, as you can see my previous post was back in February so it lasts a long time and well worth it!! I have been using this recipe for a few years now. Don’t waste your time grating the soap, use a food processor. Put in a few chunks of soap and some of the powdered ingredients to keep the soap from sticking to the blades. Blenders do not work well. I like my soap to be quite perfumey so I use 2 large or 4 small bottles of Purex crystals. They are only for smell so you can leave them out if you don’t want a scent with your soap. I use Zote because I do not like the smell of Fels, but either one works. This soap is safe for HE washers because it does not suds. Suds = bad news for washing machines. Hi! I’m a stay at home mom (first timer) who is looking to be more frugal and fill some time gaps… I’m interested in your laundry soap recipe but am wondering is the mixture HE washer safe? I have no experience with HE washers, but from everything I’ve read, it is safe. However, please do your own research – I’d hate for you to mess up your washing machine based on my advice. Hi I’d like to know if anyone knows if this recipe is septic tank friendly? Hi! Can this be made into a liquid version for front loading washers? I love this recipe only I use the zote laundry soap flakes since grating is too difficult with my bad shoulder. You can buy Zote in flakes?? I’ve never seen those! !